I had the honor of being able to visit the Kirkham International Motor Collection a while back and figured Big Rig Week was the perfect time to share some of this fantastic collection. To top it off, I visited during a classic heavy truck club’s open house and many of its members had professionally driven these vehicle when new. The eldest member of the collection is this 1913 International MW high wheeler. I’ve seen this running and driving at various summer cars shows and it has that wonderfully distinctive antique engine clatter and thrum. Only slightly newer is this 1917 Model H which saved was by noted classic vehicle rescuer/hoarder Stan Reynolds in 1956. It was then restored by heavy truck collector Ron Carey before finding its way to this collection. It even has a mini version in its bed! The Hoover Dam was built using International HS-104C trucks, like this one. I wouldn’t be surprised if this particular example, which ended its working career with the Colorado Department of Highways, labored at the dam site, as only one hundred were ever built. A full restoration bought it back to its original specification. Capacity is five tons with a Hall-Scott four-cylinder gas engine. Power goes through a three speed transmission, then a chain drive. It even has two separate reverse gears! I’d rank this 1937 International D-30 as one of the best looking big trucks ever. Timeless lines. The interior might not be plush but there is an elegant simplicity about it. There was a whole row of more modern but still classic big trucks like this 1951 International LFD 405. It is powered by a 180hp NBH Cummings with a 10 speed Fuller transmission. A few more gauges than the 1937 and a one piece windshield but the cab itself is quite similar. How about something a little smaller? This boxy 1962 International CH 90 delivery van has 152cid four cylinder power. This ex-bakery truck sports a three-speed manual transmission. The half-of-a-V8 four-cylinder engine was also found in the compact pickup, as well as in early Scouts. The smallest working International on display is this 1964 Cub Cadet 100 tractor. 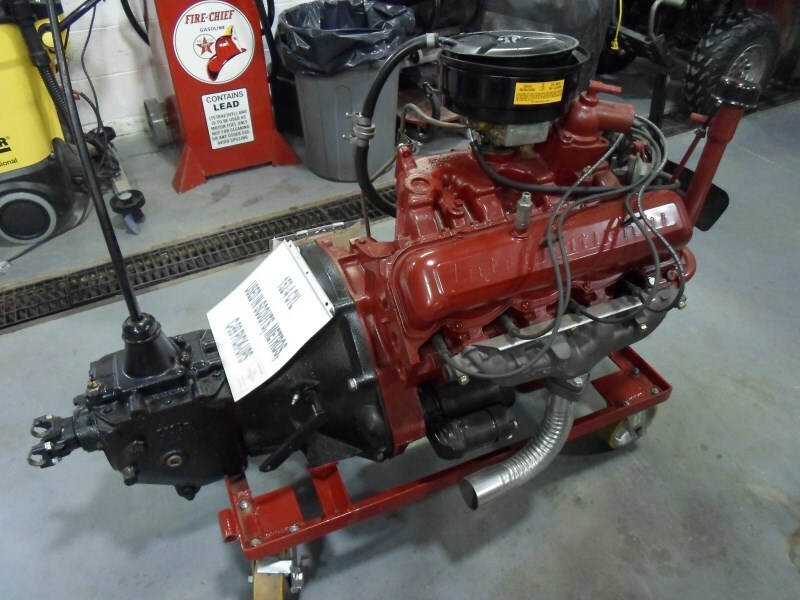 It features a 24cid 10hp Kohler engine with six possible forward ratios. Built from 1963 to 1965, production for all years totaled 42,706 units. …air conditioning on a 1964 model. What could be more cool than an International Harvester fridge? I can’t imagine the four-door model like this 1973 1010 Camper Special was ever common. It must be fantastically rare these days especially in this condition. This 3/4 ton truck is powered by a 392cid V8 engine and automatic transmission. The interior of the Wagon Master is in original and un-restored condition with dual bench seats. A shrunken bed completes the rear. I remember these Loadstars being popular as dump trucks and school buses. This 1973 International 1700 Loadstar was retired from fire truck duty. It served in British Columbia and accumulated a mere 8850 miles on its 392cid V8 and five-speed transmission. I absolutely love the paint scheme on this 1979 International Scout Traveler. Only a SUV from the Seventies could pull off bright orange. Speaking of the seventies, check the upholstery on the inside! The coloring on this 1981 International F4370 Eagle makes the orange Scout almost look tame in comparison. Old factory photos, brochures and tin signs cover the walls. Not all the trucks are big, but they are all International. This cutaway model of a 1956 549cid V8 engine certainly sparked a lot of conversations. An operational engine would have made 257hp @ 3400rpms when new. Shall we step outside? Rows and rows of parts and project trucks await. There are a couple real vintage models among the throng of Scouts and pickup trucks. International R-110 cabover looking very complete except for the missing bumper. International C-110 compact pickup truck. International BC-170 with a dual rear wheel axle. Here is a closer look at the International R-150 Metro van behind the BC-170. This one came from Edmonton which is a few hours north. That concludes our brief tour of this amazing collection. It is great to see large trucks being preserved and restored. Not many people have the inclination, skill or even the space to own a classic big rig, so too many have been merely scrapped. These Internationals at least have made it into good hands. I can’t begin to imagine the buzz/vibration from that 4-banger. I’ve driven a Scout with that engine and you are right. +1. My father had a 1970 Scout with that engine, and everything on that Scout buzzed, rattled, or vibrated. I’m sure that it rivaled a Model T for NVH. I drove one a few times too. It was ROUGH and LOUD. That’s quite an array of ‘binders there! I didn’t know those four-door pickups even existed. The Subaru Baja of its time 🙂 Or Avalanche. Somewhat oddly, they were specifically marketed to pull a fifth wheel trailer, but by the nature of its design, it wasn’t well suited for that task, as the hitch/fifth wheel ended up at the very back of the bed, well behind the rear axle line. That was probably ok for modest-sized fifth wheels, but it never caught on, and was only built for two years (72 and 73). A regular double-cab pickup was just much better at that job, as well as other purposes. I have one, it belonged to my grandfather, for quite a while it was my daily driver. One day two kids rode by on their bicycles an said “Look! It’s an old Hummer!” I fell over laughing. International Heaven! They made some of the best looking trucks in the 30s-50s. And I’ve read about those trucks used on the Hoover Dam, and their Hall Scott engines. OHC, alloy hemi-heads; I’m way overdue to write a history of Hall Scott, and their legendary high-output gas engines. Seeing that IH refrigerator above triggers a memory. When my wife and I first met, in the mid-1980’s, her parents still had an IH refrigerator dating back to ca 1950. It had been demoted to garage duty by then but it still worked well and continued to do so until they finally got rid of it several years later. IIRC the IH refrigerators were made here in Evansville, which used to be sort of a mini-hub of refrigerator manufacturing. I do know that Whirlpool eventually acquired the IH appliances operation, as well as a couple of other brands. At one time Whirlpool had numerous assembly plants here, making freezers and air conditioners in addition to the refrigerators. Sadly that is all gone away now as Whirlpool closed their last Evansville plant several years ago and moved production to Mexico. A couple of corrections. It is the Kirkham collection. The Wagonmaster is a 1010 which means that it is a 1/2 ton with IFS. There was not a camper special option for the 1010 series. Its interior is definitely not stock no velour option in 1973. A surprising number of Wagonmasters survive I know of at least a dozen in various states of road worthiness, from amazing survivors to fully restored to works in progress. They were not designed with the intention of being a 5th wheel hauler, they weren’t even designed per-se. The story is some guys in the body shop were playing around at the end of the night and placed some Travelette roof pieces on a partially finished Travelall body and someone saw it and said lets weld one up and run it up the flag pole. It was however marketed as a 5th wheel hauler and 5th wheel hitches were available specifically for it in the Neccissories catalog. As Paul mentioned if you wanted to be able to turn your combination the pin had to be behind the axle c/l negating the majority of the benefit of a 5th wheel. International’s “Compact” truck was the 900 series or if equipped with the V8 the 908. In that era the Light Line designations were 900, 1000, 1100 which were all nominal 1/2 tons. The 900 was the loss leader with a very few options available. The 1000 was the torsion bar IFS equipped model and the 1100 was the common mainstream and the only one that could be ordered with 4wd. The 1200 and 1300 were the 3/4 and 1 ton versions. AC was not all that uncommon in Travelalls in the 60’s. They were sold as an alternative to towing your travel trailer with a mere car, so they advertised that you could get them with all the “luxury” options you might add to your car such as power steering, power brakes, automatic transmission, power rear window and of course AC. As common in the era the AC could be ordered from the factory or over the parts counter for dealer installation. Either way it was the same stuff. Well, looks like you just covered all the minor corrections I was going to make. Good job. I’ve fixed the typo in the title; thanks. I got most of my information off the signs posted by the vehicles but I’ll defer to your expertise. It is somewhat possible that the exact trim and model names were slightly different from trucks built in Canada. Yes there were some differences in the Canadian market trucks the big one was that the 90x trucks were marketed as the Compact in Canada but the data plate would still say 900, not sure if they offered the 908 or not in Canada. The Wagonmaster being a “1/2 ton” is for certain just from looking at the ride height I can tell it is the IFS model. Between the deeper frame, stiffer springs and larger diameter tires the 2wd 3/4 ton 1210 rides about 5″ higher than the torsion bar IFS 1/2 ton 1010 trucks. The interesting thing about the Wagonmaster is that they didn’t offer the I beam axle 1/2 ton like they did on the Travelall. So there were only 4 models of Wagonmaster instead of the 5. An orchardist I worked for in Victoria OZ had a COE R 110 truck for carting his produce to the cannery Ive not seen one since I worked there, Awesome collection. I think International truck owners are rabidly devoted. One of the biggest International truck collections in the eastern part of the continent is owned by another private collector named George Tackaberry, in Athens, Ontario, Canada. Athens is located about 30 minutes north of the Thousand Islands Bridge and Interstate 81 in New York State. And about 1.5 hours south of Ottawa. Tackaberry’s Museum numbers about 180 trucks. I’ve seen his collection, and I would describe it as breathtaking. And includes ‘sculptures’ of various retired rigs throughout his property. Besides the 6 warehouses chock full of trucks, models and big rig related paraphernalia. Tackaberry is a model self-made businessman. And his philanthropy is well known in Eastern Ontario. He started with one GMC dump truck in 1957. Today, his construction company employs 200. Correction: The collection is housed in 12 warehouses. Thanks for a great tour of a really cool collection. My main interest is in the Scouts and Travelalls, so those are nice to see. Growing up in Fort Wayne (where Scouts and big trucks were built) there were a LOT of Scouts (and other IH trucks) running around. I remember seeing those really loud orange/yellow ones. I don’t like that color much better now than I did then, but it is cool to see one in such nice shape. Somewhere in the dim recesses of my memory, I recall seeing an old IH refrigerator in use, but I cannot recall where. Ha ! My very first 1:25 truck from Ertl is right there ! I own a 1973 Wagonmaster 1010. Last time I took it on a road trip, the most common question at gas stations (every 175 miles) was “did you make that?” In the mail just today was a copy of. Consumer Reports from1972 I bought on eBay with the test of a Travelall. Let’s just say it did not make their list of recommendations. What month is the issue? I’d like to see if I could find a copy as I’ve got a 72 Travelall. I’d love to add a Wagonmaster to my collection. It would be a great vehicle for you to write a COAL on. August 1972. I will scan it at work today. A correction, the 1/2 four cylinders were also found in later scouts – my dad had a 1976 Scout Traveler with the 196cid (3.2 liter) four. It was mated with the automatic and had acceleration of 0 to 60 mph in what felt like minutes. The Scout II with the AMC six and Torqueflite was not exactly a speed demon, either. In the 6th picture, the one showing the chain drive, does that say “Oil Change Daily”? If so, is that transmission oil and why? On a motorcycle you get the rear wheel in the air, ideally on center stand, and spin the wheel with one hand while spraying oil on with other hand. A few times around to get it all. Or you install a chain oiler, a total loss drip system. On this, I wonder how they got oil on the whole chain? Guy crawling along as the truck rolls forward? I can imagine what this truck would look like after 5 years of use, thick black within ten feet of the chain. Great post by the way, really great. Wonder how they did it too. The LeMay ACM Museum, here in Tacoma, Washington, has two of these International trucks. There’s a 1970s International Scout, and there’s also a turn of the century International. would you or someone you know be interisted in a set of solid rubber 1917 international tires and wheels. i have a set of front and rear i would like to sell. My dad has a 1913 international truck he looking for the value! Looks good he ran it a couple of years ago!